Another one of my Carpe Vinum girlfriends is dusting off her passport — she’s headed to Barcelona, Spain next month. So, the theme for Carpe Vinum this month is (you guessed it) The Wines of Catalonia. The potential for hilarious mishap with a porrón is significant. I really hope my girlfriend has at least one swig of wine from a porrón while she’s in Barcelona. And I hope she Instagrams the hell out of it! All the best dictators wear Dracula fur collars. In case you need a refresher . . . Catalonia is an autonomous region in northeastern Spain. Though not independent, Catalonia has its own flag and its own language (Catalan). It’s worth noting that Catalan is distinct — it’s not a dialect of Spanish. Catalonia has experienced varying degrees of autonomy throughout its history. After the War of Spanish Succession (a pretty big yawn in World History textbooks), Catalonia lost its sovereignty. And then it got worse — Catalonia found itself on the losing side of the Spanish Civil War (1936-39). 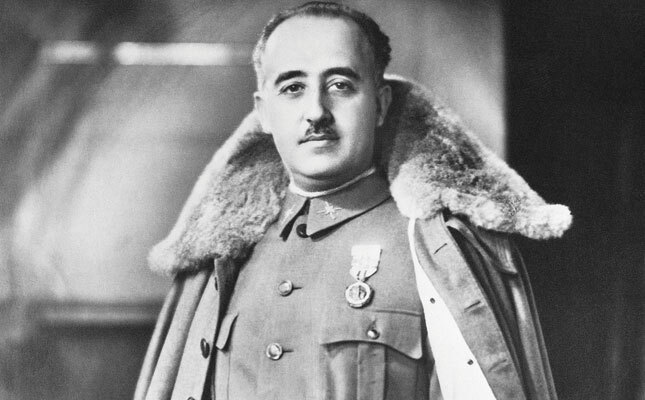 As a result, Catalonian culture and language were all but crushed during the reign of Ferdinand Franco (1939-75). Under Franco, it was illegal to use the Catalan, although it was still spoken (softly) in private homes. When Franco died in 1975, a democratic constitution for Spain recognized Catalonia’s autonomy and language. Today, calls for Catalonian independence are back on the table in a big way — change is in the wind. Circle back to Orwell. My favorite quote of the book is this observation: “For some reason, all the best matadors were Fascists.” It just makes me laugh . . . and suspect that Franco was a closet matador. Winemaking isn’t new to Catalonia — wines have been made in Catalonia for thousands of years. Catalonia has absorbed the influence of numerous cultures throughout its history, and wine has either ebbed or flowed in tandem. Wine flourished under the Romans, vines were neglected under the Moors, and the Christians shepherded a vineyard resurgence during the Middle Ages. Incidentally, El Generalísimo was no friend to wine. During his reign, a lot of vineyards and grapes were neglected or uprooted altogether. The theme in modern Catalonian winemaking is resurgence. Since the 1980s, Spanish wineries have been making a push to modernize. And with modernization came cutting-edge wine making equipment, and an influx of young, motivated, well-educated wine makers — who are just beginning to put Catalonia on the world’s wine map. Catalonia has a varied climate — dry and arid inland, but Mediterranean on the coast. These climatic differences give Catalonia a huge portfolio of grapes, and an equally diverse range of wine styles. Because of the area’s proximity to France (just on the other side of the Pyrennes Mountains), Cava is heavily influenced by Champagne, and still red wines are heavily influenced by French Rousillon. Arguably, the most well-known wine in Catalonia is Cava, Spain’s traditional-method sparkling wine. And I love Cava! It’s clean, crisp and deliciously cheap. Don’t get me wrong — I heart Champagne, but my wallet hearts Cava. Penedès — Here’s something important to know: Cava isn’t a region — it’s a style. The name Cava doesn’t derive from a place or a grape name. Cava refers to the stone caves where the wines are aged. There are roughly 160 areas that are authorized to make sparkling wine and call it Cava, and most of them are located in the Penedès region of Catalonia. Penedès was a pioneer in the modernization of Spanish wine, it was the first to use temperature controlled steel fermentation tanks. Macabeo — Usually the bulk of a Cava blend because the grape buds late, which insures against early frost damage. It’s floral with honey and grapefruit flavors. Xarel-lo — Xarel-lo is high in the antioxidant resveratrol. So, grab a bottle of Cava and drink up. You know, for medicinal purposes. Xarel-lo also lends Cava some earthy flavors that help distinguish it from French Champagne. Parellada — Native to Catalonia, it grows almost nowhere else in the world. High in acidity, with green apple and citrus flavors. Chardonnay, Pinot Noir, Garnacha, and Monastrell are also permitted in Cava — the last two are used especially for making Rosé Cava. Priorat — Priorat is one of two DOC regions in Spain (the other is Rioja). Garnacha is the primary grape of Priorat, followed closely by Cariñena. Some Cabernet Sauvignon and Merlot are also used. The name Priorat originates in the 12th century, when Carthusian monks planted a vineyard and started a priory in that location. At the end of the 19th century, Phylloxera devastated vineyards in Priorat, and vineyards weren’t replanted until the 1950s. The soil in Priorat is a somewhat unusual blend of quartz and slate called llicorella. Vines grow on steep terraces and are harvested mostly by hand. Priorat wines are fairly high in alcohol, usually between 13-18%. Alella — Located on the Mediterranean coast near Barcelona, this region makes mostly white wines. The main grape here is Pansa Blanca, a local pseudonym for Xarel-lo. Red wines here are mostly Ull de Llebre, the Catalan name for Tempranillo. Catalunya — Created in 1999, the Catalunya DO is a blanket appellation that applies to all the other little regions in Catalonia that don’t have a DO or DOQ status. Conca de Barberà — The focus in this region is on growing grapes for Cava production. Although, some Rosado is made from the local Trepat grape. Costers del Segre — This is Catalonia’s most inland wine region. A great many vineyards weren’t replanted after the phylloxera epidemic, shifting focus to olive groves instead. The main grapes here are Cabernet Sauvignon, Chardonnay, Macabeo, Merlot, Parellada, Pinot Noir and Tempranillo. Emporda — This region borders the French Roussillon. The main grapes are Grenache and Carignan. Lots of Rosado is made here. Montsant — This region is starting to gain international recognition for its still red wines, which are distinguished by older Garnacha and Cariñena grapevines. Pla de Bages — The town was originally named Bacassis, after Bacchus, the Roman God of Wine. It evolved over time to Pla de Bages, or Plain of Bacchus. The region is most known for it’s crisp, dry whites, but increasingly, international grapes like Cabernet Sauvignon and Merlot are taking root. Tarragona — Most of the grapes here are used for Cava production. The region also produces some sweet, port style wines, which end up as communion wines for churches. Terra Alta — This is the southernmost wine region in Catalonia, and also the region with the highest altitude (this makes sense, because Terra Alta translates to highlands). During the Middle Ages, the Knights Templar are said to have tended grapevines here. Terra Alta is known for Garnacha Blanca wines. There are a ton of wine choices on the menu in Catalonia. For sure, the most readily available Catalonian wines are Cava and Priorat. It’s more of a challenge to find the other Catalonian DO wines, but it can be done. You just have to be willing to look. Here’s to Catalonia . . . stay tuned for the wines and our food pairings! Nice post. I learned a lot by reading this 🙂 Thanks! I definitely need to improve my knowledge of Spanish wine.. Thanks, Julian! You can hardly go wrong with Spanish vino . . . Salud! Very informative! And yes, your girlfriend totally needs to instagram the hell out of a porrón! Well done! You KNOW I like Catalan Wine! 🙂 If your girlfriend needs a local guide, especially if she wants to get our of Barcelona, to explore the wine regions and visit some nice small cellars, let me know! 🙂 Visca Cataunya! Thanks! I think she’d love to get out of Barcelona. How can I put her in touch with you?? Thanks so much! I gave your contact info to my girlfriend . . . she’s leaving later this week. Hopefully, you will hear from her! Salud!! She should go to a calçotada. While the season is drawing to a close by the time she arrives, they can still be found around Tarragona. And yes, you will definitely experience the porró if it’s an authentic calçotada.